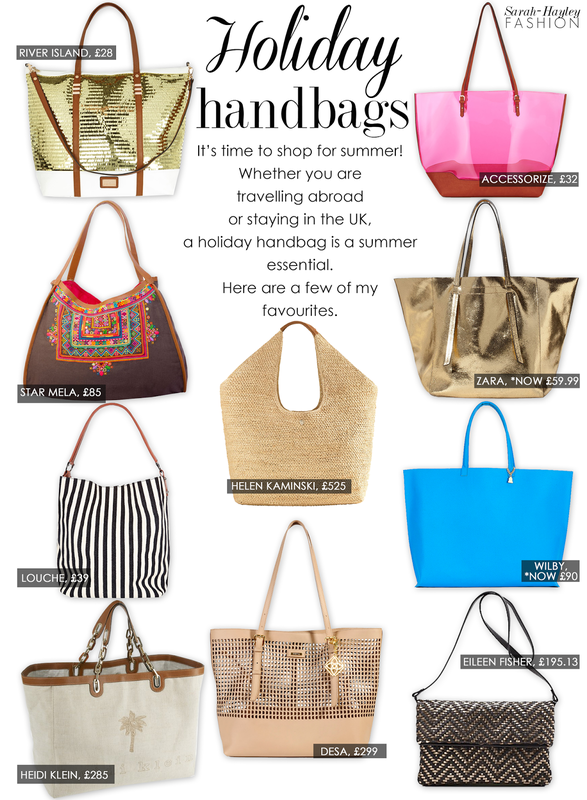 With various types of holidays, from beach getaways to city breaks, I have selected my favourite handbags to ensure perfect holiday style and practicality. My favourite is Wilby's vibrant over-sized tote made from sustainable cork. Incredibly spacious, this bag can hold all essentials and more. To add suitable shine to your holiday, Zara's metallic number is your ideal sightseeing bag. Room for your shopping including a few magazines and picnic. However, for understated chic, opt for Helen Kaminski's 'Pia Bag' from Beach Cafe. Made from rafia with leather handles, it comes with an extensive price tag although it is a forever bag, timeless and elegant. On holiday versatility is the key. I love Eileen Fisher's Chevron Weave Bag which comes with a removable strap, so you can wear it on your shoulder or carry it like a clutch.